Could falling land prices be the boon the build-to-rent sector needs? Falling residential land prices are presenting an opportunity for build-to-rent to find its place in the sun. Pictured: 393 Macaulay Road, Kensington, a Melbourne build-to-rent hybrid developed by Kris Daff. The struggling sector could pick up this year, as falling land prices will boost the economics of prospective projects by lowering a significant hurdle to new developments, CBRE says in its Australia Real Estate Market Outlook 2019 report. It's just one of the opportunities presented by a slowing economy, as overseas and domestic headwinds impact economic growth this year. "Lower residential land prices will improve returns on prospective build-to-rent developments, with the pace of progression in this emerging sector expected to pick up in 2019," Mr Speers said. Pictured: 393 Macaulay Road, Kensington, a Melbourne build-to-rent hybrid developed by Kris Daff. Image supplied by Assemble. A potential change of federal government could lead to new policies, making build-to-rent a more viable option. The sector is currently hampered by the Coalition's decision not to allow build-to-rent projects the lower 15 per cent withholding tax rate enjoyed by foreign investors in other sectors of Australian property. Could the build-to-rent model take off in Australia? Some developers are pushing on anyway. 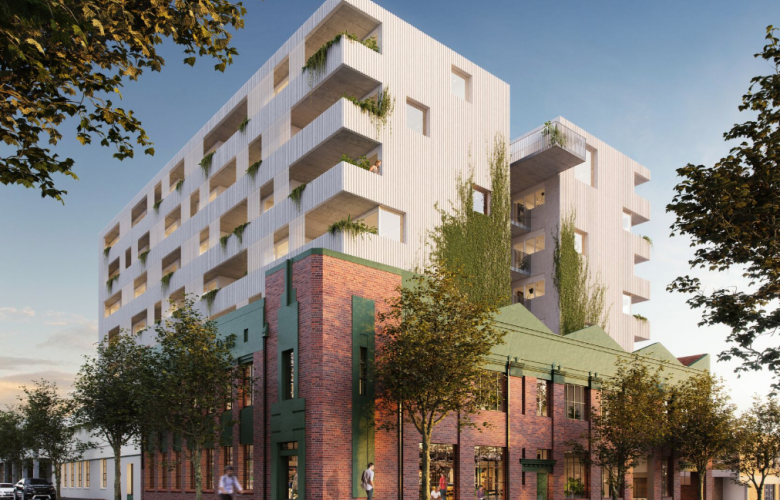 Queensland developer Habitat is adding another 176 apartments from its new Sunshine Coast development to its existing build-to-rent portfolio of 650 homes, while Grocon is set to deliver a 60-storey development in Melbourne's Southbank, designed by architecture firm Bates Smart. Under the build-to-rent model, investors team up with developers and governments to build high-quality apartments on a large scale, with the sole purpose of renting them out at an affordable price. While one of Australia's largest apartment developers, Meriton's Harry Tribuoff, has shot down the idea saying there "isn't enough profit in it", The Property Council of Australia and several major developers like Lendlease, Grocon, Mirvac and Stockland have publicly supported it, with some in talks with the NSW and Victorian governments. Meanwhile, Melbourne developer, Kris Daff, has developed a hybrid model of a build-to-rent apartment alongside property development company, Assemble. Director of Bates Smart Julian Anderson told WILLIAMS MEDIA the build-to-rent model is the way forward. "The demand for residential property and places to live is not diminishing. If Melbourne’s population does double in the next 25 years, as forecast, we need to address the issue of housing provision in central Melbourne. The build-to-rent typology provides an opportunity for countercyclical investment in residential property to continue to deal with this demand while offering a more stable and secure rental environment than currently exists for tenants," Mr Anderson said. Andrew Fawell, Director of Beller Property Group says the build-to-rent model is an approach favoured by investor developers who know the cost of development and where the big gains are to be had. “There is a real need in the rental market for attractive and affordable living spaces, not just one bedroom units,” Mr Fawell told WILLIAMS MEDIA. Mr Fawell believes that we are now looking at potentially generational renters in Australia. "Given the continuing lack of affordability in the Australian housing market, it is a safe bet that you will have future tenants lining up to take new property stock," he added.